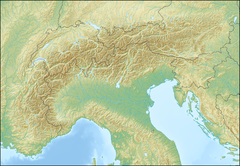 The 1956 Winter Olympics, officially known as the VII Olympic Winter Games (French: Les VIIes Jeux olympiques d'hiver; Italian: VII Giochi olimpici invernali), was a multi-sport event held in Cortina d'Ampezzo, Italy, from 26 January to 5 February 1956. 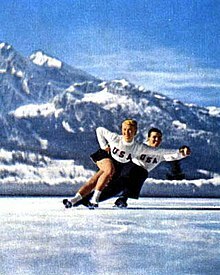 Cortina, which had originally been awarded the 1944 Winter Olympics, beat out Montreal, Colorado Springs and Lake Placid for the right to host the 1956 Games. The Cortina Games were unique in that many of the venues were within walking distance of each other. The organising committee received financial support from the Italian government for infrastructure improvements, but the rest of the costs for the Games had to be privately financed. Consequently, the organising committee was the first to rely heavily on corporate sponsorship for funding. Thirty-two nations—the largest number of countries participating in the Winter Olympics until then—competed in the four sports and twenty-four events. Austrian Toni Sailer became the first person to sweep all three alpine skiing events in a single Olympics. The figure skating competition was held outdoors for the last time at these Games. Logistically, the only problem encountered was a lack of snow at the alpine skiing events. To remedy this, the Italian army transported large amounts of snow to ensure the courses were adequately covered. Politics did not affect the 1956 Winter Games as at the Summer Games in Melbourne, Australia, where the Soviet repression of the Hungarian Revolution and the Suez War caused many nations to boycott the Games. The Cortina Olympics were the first Winter Olympics televised to a multi-national audience. These were the first Olympic Games under the IOC Presidency of Avery Brundage. A total of 32 nations sent athletes to Cortina d'Ampezzo. Along with the Soviet Union, Bolivia and Iran competed at the Winter Games for the first time, making Bolivia the first completely Tropical nation to participate in a Winter Olympic. Korea, Liechtenstein, and Turkey returned after having missed the 1952 Winter Olympics, while Argentina, Denmark, New Zealand, and Portugal did not compete at these Games, after having participated in the previous edition. Athletes from West Germany (FRG) and East Germany (GDR) competed together as the United Team of Germany, an arrangement that would continue for the following two Olympiads. The Cold War began after the allied victory in World War II. Until 1952, many of the Communist countries of Eastern Europe had participated in Worker's Olympics or Spartakiads. The Soviet Union emerged from international isolation by eschewing the Spartakiad and participating in the 1952 Summer Olympics in Helsinki; they made their Winter Olympics debut at the Cortina Games. Soviet general secretary Nikita Khrushchev's aim was to use international sports competitions, such as the Olympics, to demonstrate the superiority of communism, strengthen political ties with other communist countries, and project the Soviet Union as a peace-loving nation actively engaged in the world. The Soviets' participation at the Olympics raised the level of competition as they won the most medals and more gold medals than any other nation. The Cortina Games were held before the Hungarian Revolution and subsequent Soviet invasion, and the Suez War, which occurred in the autumn of 1956; the Winter Games escaped the boycotts that plagued the Melbourne Olympics, which were celebrated in November and December of that year. The Cortina Games were the first Winter Olympics to be broadcast to a multi-national audience. Television as a mass communication technology was expanding rapidly in the 1950s. In the midst of the Cold War, Europe was a propaganda battlefield as countries relayed television signals across the Iron Curtain. 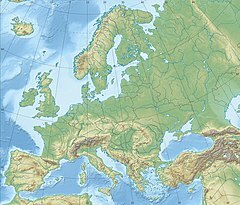 By 1956, countries in the Soviet sphere of influence had achieved a technological advantage and were able to broadcast communist television programmes into Finland, the eastern border regions and more isolated geographic areas of West Germany and Austria, where residents had coverage from an East German broadcast with a pro-communist point-of-view. Most West Germans watched the 1956 Winter Olympics via Eurovision broadcasts which were relayed all over western Europe including all major West German stations (Eurovision connectivity in 1956 ) The political ramifications were not the only impact television had these Olympics. The Cortina Games did not generate revenue from television – the 1960 Winter Olympics in Squaw Valley were the first to do so – but were an experiment in the feasibility of televising a large multi-sport event. For the first time at an Olympic Games, the venues were built with television in mind. For example, the grand stand at the cross-country ski venue (Lo Stadio della neve) was built facing south so that the television cameras would not be adversely affected by the rising or setting sun. Medals were awarded in 24 events contested in 4 sports (8 disciplines). The programme for the 1956 Winter Games saw two new events added to the four sports and twenty-two events from the 1952 Olympics, namely the men's 30 kilometre cross-country ski race and the women's 3x5 kilometre cross-country relay race. The eighth Olympic ice hockey tournament also served as both the European and World Championships. Split into three pools before the tournament, the ten participating nations began by playing each team in their pool in a round robin format. The top two teams from each pool advanced to the final round, with the remaining teams played in a consolation group for 7th through 10th places. Canada, Czechoslovakia, and the Soviet Union took first place in their preliminary pools with undefeated records. Germany, the United States, and Sweden took second place in their pools. An important early matchup of the final round was the game between Canada and the United States. The Canadians had never lost to the US in Olympic play prior to that game. In what was considered a tremendous upset, the United States defeated Canada 4–1. The Americans, who placed fourth at the 1955 World Ice Hockey Championships and were not expected to medal, then faced the USSR, who won the tournament in 1954 and took silver in 1955 behind Canada, in a game that would eventually make the difference in the gold medal. The Soviets overwhelmed the underdogs and won the match 4–0. The USSR then played Canada, who still had a chance to win the gold if they defeated the Soviets, and won 2–0 despite being dramatically outscored in the first and second periods. The USSR won gold, the United States surprisingly took silver and Canada, with their two losses, earned bronze, their worst result to date in Olympic play. The closing ceremonies took place on Sunday, 5 February in the Olympic Ice Stadium. They were preceded by a figure skating exhibition performed by the men's, women's, and pairs figure skating champions. The flag bearers of each nation then entered the stadium followed by the flags of Greece and the United States. These two flags were raised to honor the nation that founded the Olympics and the next country to host the Winter Games. Avery Brundage, President of the International Olympic Committee, declared the Olympics closed, and a fireworks display concluded the Games. ^ The emblem is a stylized snowflake with the Olympic rings and a star, the emblem of the Italian National Olympic Committee. ^ a b c d e f g "Cortina d'Ampezzo 1956". International Olympic Committee. Archived from the original on 12 February 2010. Retrieved 3 March 2010. ^ Robertson (1903), pp. 172–173. ^ Comitato Olimpico Nazionale Italiano 1956, p. 85. ^ a b c Findling and Pelle (1996), p. 258. ^ Findling and Pelle (1996), pp. 246–247. ^ Findling & Pelle (1996), p. 259. ^ Comitato Olimpico Nazionale Italiano 1956, p. 82. ^ Mallon, Bill; Ove Karlsson (May 2004). "IOC and OCOG Abbreviations for NOCs" (PDF). Journal of Olympic History. 12 (2): 25–28. Retrieved 2 March 2010. ^ a b Comitato Olimpico Nazionale Italiano (1956), p. 156. ^ a b "1956 Cortina d'Ampezzo, Italy". CBC Sports. Canadian Broadcasting Corporation. 18 December 2009. Retrieved 2 March 2010. ^ Judd (2008), p. 27. ^ Keys (2006), p. 295. ^ Findling and Pelle (1996), p. 260. ^ Toohey and Veal (2007), p. 148. ^ a b Schwoch (2009), p. 39. ^ "Eurovision and the Olympic Games". eurovision.net. Archived from the original on 2 July 2012. Retrieved 4 December 2013. ^ "Eurovision connectivity timeline (1956)". eurovision.net. Retrieved 4 December 2013. ^ Spence, Jim (20 November 1988). "Are Olympic TV rights worth the price?". The New York Times. Retrieved 29 July 2011. ^ "Olympics and Television". Museum of Broadcast Communications. Archived from the original on 28 June 2011. Retrieved 29 July 2011. ^ a b "1956 Cortina d'Ampezzo Winter Games". Sports Reference LLC. Retrieved 13 March 2009. ^ "Cortina 1956 Olympic Winter Games Report" (PDF). la84.org (in Italian and English). pp. 570–571. Retrieved 4 December 2013. ^ Comitato Olimpico Nazionale Italiano (1956), p. 635. ^ "Bobsleigh at the 1956 Cortina d'Ampezzo Winter Games". Sports Reference LLC. Archived from the original on 2 June 2009. Retrieved 30 May 2009. ^ "Italy Bobsleigh: Men's Two". Sports Reference LLC. Retrieved 18 June 2009. ^ "Italy Bobsleigh: Men's Four". Sports Reference LLC. Retrieved 18 June 2009. ^ "Cortina d'Ampezzo:track profile". The Fédération Internationale de Bobsleigh et de Tobogganing (FIBT). Archived from the original on 19 July 2011. Retrieved 15 March 2010. ^ a b Noverr and Ziewacz (1983), p. 232. ^ Zillgitt, Jeff (24 February 2006). "Skating Great Albright steps back". USA Today. Archived from the original on 11 February 2011. Retrieved 3 March 2010. ^ "Figure Skating at the 1956 Cortina d'Ampezzo Winter Games". Sports Reference LLC. Archived from the original on 21 January 2010. Retrieved 2 March 2010. ^ "Pairs Figure Skating at the 1956 Cortina d'Ampezzo Winter Games". Sports Reference LLC. Retrieved 15 March 2010. ^ Comitato Olimpico Nazionale Italiano (1956), p. 641. ^ Comitato Olimpico Nazionale Italiano (1956), p. 650. ^ "Sigvard Erickson". Sports Reference LLC. Retrieved 13 March 2010. ^ "Alpine Skiing at the 1956 Cortina d'Ampezzo Winter Games". Sports Reference LLC. Archived from the original on 10 June 2009. Retrieved 8 June 2009. ^ "Chiharu Igaya". Sports Reference LLC. Retrieved 23 August 2010. ^ "Cross Country Skiing at the 1956 Cortina d'Ampezzo Winter Games". Sports Reference LLC. Archived from the original on 10 June 2009. Retrieved 8 June 2009. ^ "Sixten Jernberg". Sports Reference LLC. Retrieved 10 March 2010. ^ a b c "Nordic Combined at the 1956 Cortina d'Ampezzo Winter Games". Sports Reference LLC. Retrieved 16 March 2010. ^ "Nordic combined Equipment and History". The International Olympic Committee. Retrieved 16 March 2010. ^ "Ski Jumping Equipment and History". International Olympic Committee. Archived from the original on 18 February 2010. Retrieved 15 March 2010. ^ "Results:Cortina d'Ampezzo". International Ski Federation. Archived from the original on 18 March 2010. Retrieved 15 March 2010. ^ "Ski Jumping at the 1956 Cortina d'Ampezzo Winter Games". Sports Reference LLC. Retrieved 15 March 2010. ^ Price, George (December 1958). "Red:and lie detector, startling breakthroughs in space research, home heating, criminology". Popular Science Monthly: 93–96, 216–217. Retrieved 10 March 2010. ^ Essex, Stephen; Chalkley, Brian (2002). "The Changing Infrastructural implications of the Winter Olympics, 1924–2002" (PDF). Bollettino della Societa Geografica Italiana. Archived from the original (PDF) on 24 February 2009. Retrieved 10 February 2009. ^ "Cortina – Impianti sportivi" (in Italian). Cortina Turismo. Retrieved 28 November 2013. ^ "Cortina Impianti sportivi" (in Italian). cortina.dolomiti.org. Retrieved 1 December 2013. ^ Comitato Olimpico Nazionale Italiano (1956), pp. 175–179. ^ "Cortina 1956 Olympic Winter Games Report" (PDF) (in Italian and English). la84.org. pp. 137–138. Retrieved 3 December 2013. ^ "Cortina 1956 Olympic Winter Games Report" (PDF) (in Italian and English). la84.org. pp. 138–155. Retrieved 3 December 2013. ^ Comitato Olimpico Nazionale Italiano (1956), pp. 164–174. ^ Comitato Olimpico Nazionale Italiano (1956), pp. 180–188. ^ "Film locations for For Your Eyes Only". The Worldwide Guide to Movie Locations. 22 March 2009. Archived from the original on 26 November 2010. Retrieved 22 October 2010. Comitato Olimpico Nazionale Italiano (1956). VII Olympic Winter Games: Official Report (PDF). Cortina d'Ampezzo. Retrieved 10 March 2010. Findling, John E.; Pelle, Kimberly D. (1996). Historical Dictionary of the Modern Olympic Movement. Westport, US: Greenwood Publishing Group. ISBN 0-313-28477-6. Retrieved 17 September 2011. Guttman, Allen (1986). Sports Spectators. New York, NY: Columbia University Press. ISBN 0-231-06401-2. Retrieved 17 September 2011. Judd, Ron C. (2008). The Winter Olympics. Seattle, US: The Mountaineers Books. ISBN 1-59485-063-1. Retrieved 10 March 2010. Keys, Barbara (2006). 1956 European and Global Perspectives. Leipzig, Germany: Leipziger Universitätsverlag. ISBN 3-937209-56-5. Retrieved 17 September 2011. Noverr, Douglas A.; Ziewacz, Lawrence E. (1983). The Games they Played. Chicago, US: Rowman & Littlefield. ISBN 0-88229-728-7. Retrieved 17 September 2011. Riordan, James (1977). Sport in Soviet Society. Cambridge, England: University of Cambridge Press Syndicate. Retrieved 17 September 2011. Robertson, Alexander (1903). Through the Dolomities. London, England: George Allen. Retrieved 23 March 2010.